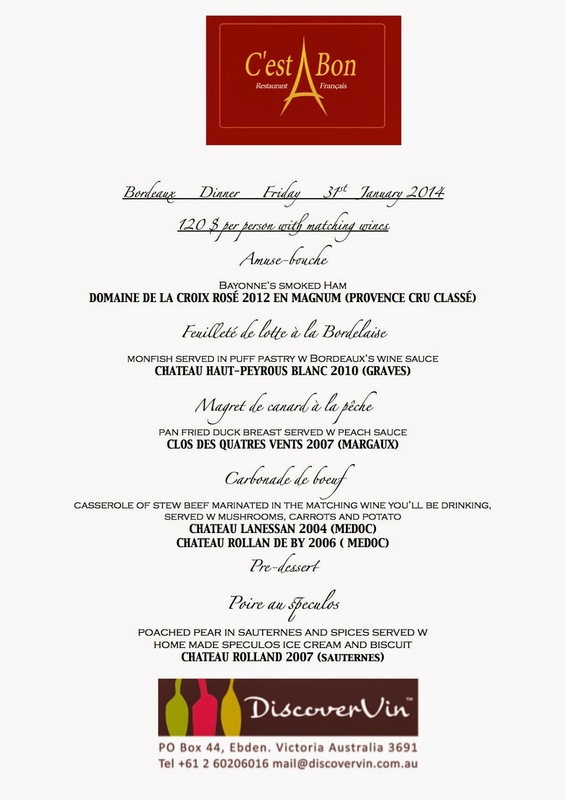 DiscoverVin was pleased to do another food and wine event with Celine Damour and her team at C'est Bon restaurant in Woolloongabba on January 31st. This restaurant has a loyal following and is well known for its award winning cuisine. It is a bastion of french culture, cuisine and hospitality. Guests were welcomed with a refreshing glass of rosé by Domaine de la Croix Irresistable cru classé from Provence. Poured from magnums and accompanied by an amuse -bouche of Bayonne Ham, it was a great start to the evening. 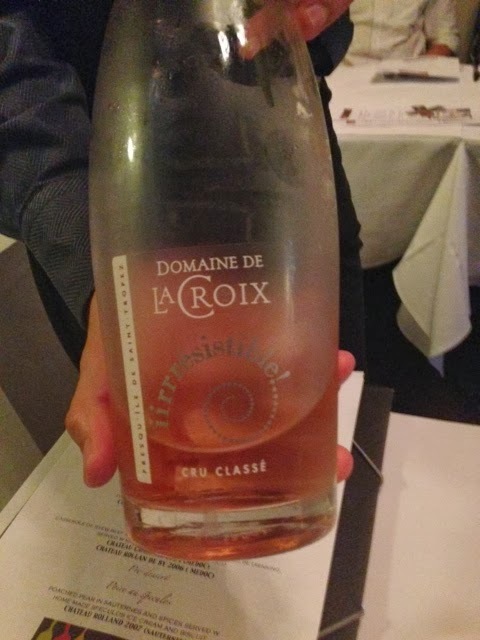 Domaine de la Croix is a classy, crisp rosé from a premium producer. It comes in a stunning bottle. The magnum certainly turns heads at events and dinner parties. This is currently one of our best selling wines and so it was not really a surprise it was so well enjoyed by all as an aperitif. 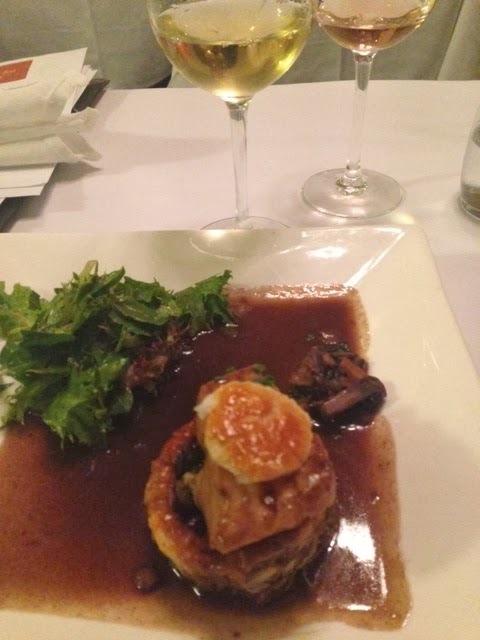 The first sit down course was a beautiful dish- Monkfish in a pastry case with a rich red wine sauce. It was perhaps a little unusual to have a red wine sauce with fish, but since monkfish is a fairly robust fish, it worked well. Chateau Haut Peyrous-Pêche au Carrelet-Graves Blanc 2010. This organic white wine is made by Marc Darroze who recommends that it is served with fish dishes or eel. It was perfect with the monkfish. Many commented that this textural dry white wine was the match of the night. 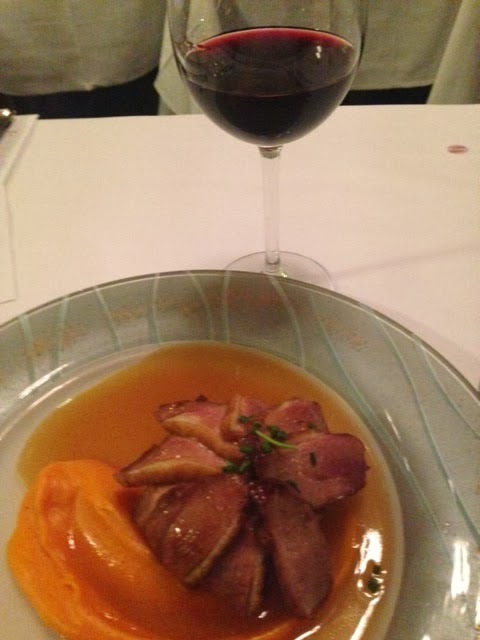 Next up was one of our favourites, duck breast with a peach sauce which was beautifully cooked (not overdone) and with a lovely sauce taking advantage of a seasonal ingredient. The wine was really special and one that we have not often had the chance to show at a dinner: Clos des Quatres Vents 2007 from the Margaux appellation on the left bank of Bordeaux. Clos des Quatre Vents consists of a tiny 1.2 hectare plot planted with Merlot and Cabernet Sauvignon. The proprietor is Luc Thienpont. The estate produces only 6000 bottles/500 cases from a vineyard planted with very old vines with an average age of 80 years old. The vineyard is situated on a plateau at the entrance to the town of Margaux, surrounded by Cru Classée vineyards. It showed its obvious class, with layered deep fruit, fine tannins. It has balance, poise and restraint. Wonderful! 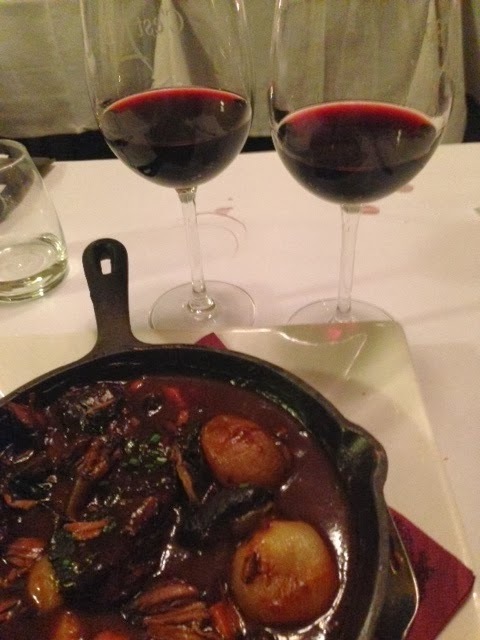 The main course was a rich beef stew- boeuf carbonnade. We served 2 older Bordeaux wines. Chateau Lannessan 2004 and Chateau Rollan de By 2006. Both married beautifully with the rich beef dish. The room was divided on which was better. Some preferred the Lannesan with its soft integrated tannins and some preferred the Rollan de By, a classy wine currently being served in Air France business class ! We then had a refreshing pre-dessert, an apricot and fennel sorbet, which sharpened our palettes for desert. 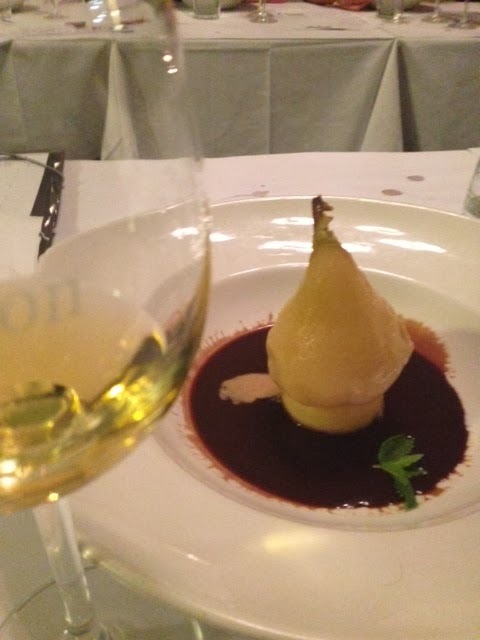 Dessert was spectacular, a pear poached in sauternes , sitting on a hazelnut biscuit base and surrounded by a cinnamon and chocolate sauce. To accompany this was a classic sauternes from a small family producer Chateau de Rolland 2007 . The "10 best list" in France in 2013 named this wine in the 10 best value Bordeaux wines. It was perfect with the pears and a great way to finish a wonderful night of great food and wines.